Spreadsheet apps are great for crunching numbers, but if you know your way around them, they can be used to do a whole lot more, like create amazing works of art the way 76-year-old Tatsuo Horiuchi did. Okay, no, that’s a LOT of work. 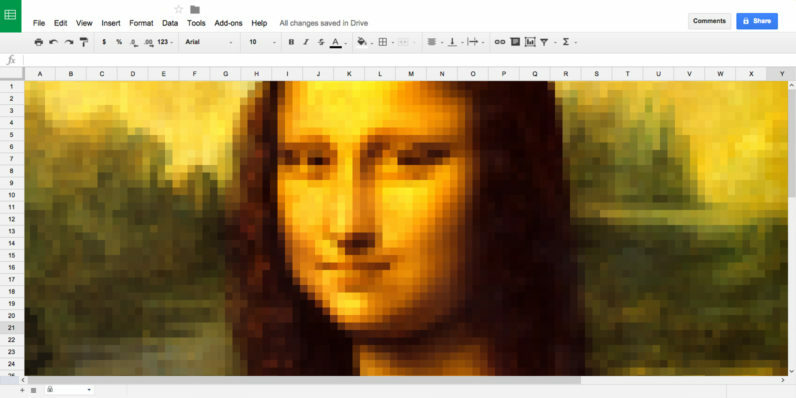 Instead, you can just use code wizard Amit Agarwal’s nifty Google Sheets template, feed it a 300×300 pixel image and watch the Web app turn it into a perfect piece of spreadsheet art. It’s a neat little trick that only takes a couple of minutes, but will wow your colleagues who’ve been goading you for weeks to learn some basic spreadsheet macros. Click on ‘Spreadsheet Art’ in the menu bar, choose the Image Upload option and locate the picture that you want to use from your desktop. In the same menu, click on the “Apply Colors” option and wait for the script to change the background color of every cell on the spreadsheet. Once it’s done, find Step 3 and enter a cell size, like 1 pixel or 5 pixels, to turn the rectangular cells into squares. And that’s it! You can turn off the gridlines in the View menu if necessary. When you’re happy with the result, you can save the result to send to a friend or use the artwork as the first sheet of your report to blow your boss’ mind.